Check out Lotto Agent for a reliable, easy-to-use website and secure lottery services at affordable prices. Lotto Agent operates out of Belize, with staff in the US, Latin America, and Europe. The company started in 2012, which makes it relatively younger than other lottery sites. Despite this, Lotto Agent has quickly climbed our rankings thanks to major points like great security measures, a range of supported payment methods, and deep discounts. We have a few quibbles that keep Lotto Agent from taking the top spot. Nevertheless, Lotto Agent is a great option for players who want to be official participants in lotteries from around the globe. Lotto Agent started in 2012, making it a relatively young website in the online lottery world. It’s owned and operated by Agento Ltd., which is based in Belize. As part of its operations, Lotto Agent maintains a main office in Belize, as well as teams in the USA, Latin America, and Europe. The company also holds a gaming license from the Government of Curacao. Like its name suggests, Lotto Agent is an online lottery agent. It takes users’ lottery entries online and buys official tickets on users’ behalf. How does Lotto Agent work? Lotto Agent gives you access to 19 different lotteries, with no limits on how many tickets you can buy. Unlike other sites, though, Lotto Agent doesn’t offer syndicates or other games like scratchcards. Multiple draws: When you buy a ticket, you can choose to use the same numbers in upcoming draws. Lotto Agent automatically records your choices and enters these in the next games. Subscriptions: Similar to multi-draw purchases, a subscription automatically buys you tickets for all upcoming draws within your chosen period. Systematic forms: You can select more numbers and buy tickets that cover as many combinations of those numbers as possible. Lotto Agent is one of the few lottery sites that gives you this option. Lotto Agent helps you play official lottery games, so you’re always a valid participant. This means that you’ll have no problems claiming your winnings if you hit any prizes. What’s more, your winnings will be paid by the lottery operator itself. Lotto Agent offers quick, easy login and registration. You can get a Lotto Agent account with a snap of your fingers — or close enough, anyway. To register, you just need your name, email address, and preferred password. Looking for Lotto Agent’s login page instead? You can bring up the login form by clicking the “Log In” option at the top of the Lotto Agent website. No need for promo codes here: Lotto Agent includes discounts by default when you buy multiple tickets. Even just jumping up to 3 tickets, for example, gets you 6% off immediately. That said, Lotto Agent does regularly send promo codes to users via email. If you’ve already got an account, keep an eye on your inbox for deeper discounts. Lotto Agent also offers a “Buy 1, Get 1 Free” ticket promo. If you get a subscription, you’ll get every 10th ticket for free. Lotto Agent also runs “Invite a Friend” promos. You can earn $5 credits for every friend who signs up and buys a ticket. Just some of the games offered at Lotto Agent. Lotto Agent has a good selection of games, though more variety would’ve been better. Lotto Agent gives you access to 17 different lotteries from the USA, Latin America, and Europe. Lotto Agent claims to have selected the best-value lotteries from these areas. 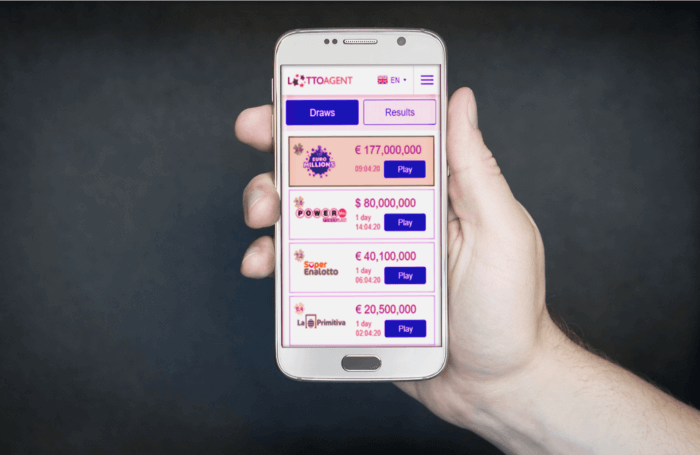 A quick look shows they’ve hit this goal: Users get a good mix of affordable lotteries that nevertheless offer sizable prizes and a range of odds. TheLotter carries two Powerball games: the blockbuster US Powerball and the more modest Australian Powerball. You can buy up to 20 lines (tickets) at a time. Lotto Agent automatically adds discounts if you buy 3 or more tickets, so this site can definitely be an affordable option for Powerball enthusiasts. New players are in luck: Lotto Agent’s Powerball page includes essential information about the game. You can read up on everything from how many numbers you’ll need to how winnings are taxed. If you’re specifically interested in the Powerball game (whether US or Australian), you can even sign up for email notifications of jackpots and upcoming draws. Lotto Agent sets itself apart from the competition by offering livestreams of the Powerball draw. If you’d like a bit more excitement when it comes to your lottery results, then definitely check out Lotto Agent. You’ll still get a quick list of results, but if you have more time to burn, watching the actual draw can offer some fun. Lotto Agent also offers users the chance to play US Mega Millions. Like the Powerball, Lotto Agent’s Mega Millions tickets come with bigger discounts the more you buy. You’ll also find information about the US Mega Millions lottery. Do you want to know what the Megaplier does? How about the tax rate for Mega Millions winnings? You’ll find the answers you need at the Lotto Agent site. Of course, that includes basics like draw schedules and results. You can also view videos of the Mega Millions draws. There’s a livestream for the latest draw, but you can also check out an archive of previous videos if you’d like. Lotto Agent allows you to buy EuroMillions tickets, though it’s not specified which country your tickets will be bought in. One nice touch: while the jackpot is displayed in euros by default, Lotto Agent includes a tooltip that converts the amount to US dollars. The EuroMillions page also carries essential information about the game, like which numbers you can choose from and whether or not your winnings will be taxed. 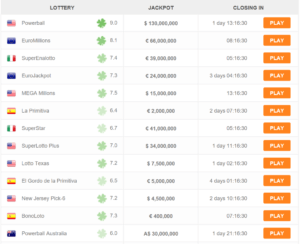 As with the US Powerball and Mega Millions, you can also watch the EuroMillions draw live via Lotto Agent. Lotto Agent gives you draw livestreams and results for 17 lotteries. You can find up-to-date results for the 17 lotteries you can play with Lotto Agent. There’s a quick-look list of the latest results for all games. If you want more information, each game also gets its own page. There, you’ll find a livestream of the current draw, as well as lists of previous results. You can even check the video archive if you’d like to watch previous draws. If you’re waiting for a specific draw, you can also sign up for email notifications to get instant updates on the results. Lotto Agent doesn’t offer any scratch cards. Unfortunately, Lotto Agent doesn’t offer syndicates for any of its games. If you’d like to try your hand at group play, check out excellent alternatives like the syndicates-focused Bmillions instead. Is Lotto Agent a scam? Definitely not! Lotto Agent has been in the online lottery business for over 6 years now. Its business model works by buying you (the user) official entries to your chosen lottery games. The games on offer are all legitimate, state-run games, too — from the US Powerball to EuroMillions. That means you’re participating in established lotteries, and any prizes will be coming directly from the lottery operator. All purchases include a scanned copy of your official ticket. Lotto Agent’s Terms and Conditions guarantee that you’ll get the physical ticket if you ever need to claim a prize. Plus, Lotto Agent is licensed and regulated by the Curacao government, so you’ve got a strong assurance that they won’t just take your prize for themselves. Yes! Lotto Agent is run by Agento Ltd., a company that’s based in Belize. It carries a Curacao gaming license, too. Definitely. All the information that passes through Lotto Agent’s website is secured with 256-bit SSL encryption provided by Comodo. Financial transactions are also processed by Lotto Agent’s PCI compliant system, meaning your money goes through a system that passes the most demanding online banking regulations. Is Lotto Agent a real or fake company? Lotto Agent is a real company that’s been offering online lottery services since 2012. Agento Ltd. owns Lotto Agent. This company is based in Belize and maintains staff in all the countries that run the lotteries offered on the website. How does Lotto Agent make money? Lotto Agent adds a handling fee to all its ticket prices. It doesn’t charge commission on your winnings. Yes! Lotto Agent holds a gaming service provider license from the government of Curacao. That means it’s passed official inspections and adheres to government regulations for handling lottery services. Your country’s laws might forbid you from playing through Lotto Agent, though. It’s best to check if you’re in a country that allows you to play lotteries online. For example, Australia has recently banned lotto betting. We reached out to Lotto Agent to ask how this would affect their Australia-based games. Moving forward, Lotto Agent will continue carrying Australian games. However, in compliance with Australia’s new laws, it will soon stop allowing Australian players to use its platform. Does Lottery Critic Trust Lotto Agent? Yes. Lotto Agent ticks the most crucial boxes when it comes to security and reliability. There’s the strong 256-bit SSL encryption from one of the most trusted SSL certificate providers around. There’s legitimate government licensing. Finally, there’s compliance with financial standards that ensure your money is safe. Lotto Agent gives you full support when it comes to claiming prizes. Lotto Agent doesn’t deduct any commisions from your winnings. However, depending on the laws that apply to particular lotteries, Lotto Agent may have to subtract taxes and/or bank transfer fees before sending your prize money. You’ll get secondary winnings credited straight to your Lotto Agent account. From there, you can withdraw the money using any of Lotto Agent’s available banking methods. Big or locally taxed prizes usually need to be claimed in person. For these, Lotto Agent sends a representative to give you your physical ticket and assist you with the process of claiming your prize. In some cases, Lotto Agent may also help you with some of the expenses involved — especially if you live far from the country where the lottery operator is based. There are 7 ways to withdraw money from your Lotto Agent account. Depending on the chosen method, you might have to pay bank transfer fees. Just go to your account’s “Withdrawals” page. Lotto Agent gets two thumbs up for its wide range of payment methods. Lotto Agent gives you 21 deposit methods and 7 withdrawal methods to choose from. What’s interesting is that there’s support for cryptocurrencies like Bitcoin and Ethereum, which might be a big plus for users who don’t want to link their bank accounts. Has anyone won on Lotto Agent? Magnus A. from Norway won €968.45 in Spain’s BonoLoto draw on October 11, 2018. Natan H. from Bulgaria won $501 in the US Mega Millions draw on October 12, 2018. Trung C. from Pakistan and Ronald G. from South Africa both won €462.16 in Italy’s SuperEnaLotto draw on October 13, 2018. Lotto Agent offers a mobile app exclusively for Android. Lotto Agent lets users track and play their favorite lottery games on the go — that is, if those users are on Android phones. Anybody on an iOS device will have to make do with Lotto Agent’s mobile-optimized webiste. Lotto Agent’s app has a simple, uncluttered interface that runs smoothly on mobile. If you don’t have time to access the Lotto Agent site on your computer, the mobile app is a great alternative. Lotto Agent promises 24/7 support and DIY troubleshooting resources. Lotto Agent offers tons of guides to help new users get accustomed to the website. You’ll find step-by-step instructions for everything from buying your first ticket to depositing or withdrawing money. There’s also a comprehensive FAQ that does a good job of answering basic questions. Unfortunately, Lotto Agent’s live chat doesn’t always have enough agents to keep up with the demand. The chatbox doesn’t let you know how long you’ll have to wait, either. Lotto Agent doesn’t stray far from the formula, but it does that formula right. 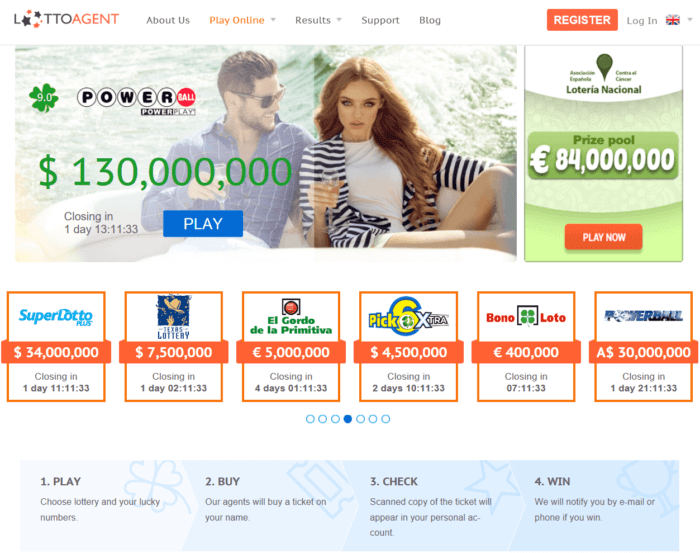 Lotto Agent is relatively new for a lottery website, and it seems more focused on offering a well-curated experience rather than a staggering range of services. Still, this focus seems to be paying off: Lotto Agent delivers one of the most pleasant online lottery experiences available. Lotto Agent’s website has a straightforward, user-friendly design, though it could use more language options. Lotto Agent’s website instantly gives you the latest draw results, upcoming draws, and links to promos — all without feeling cluttered or overwhelming. The top navigation bar gives you a convenient starting point for jumping to key pages like ticket purchases and lottery results. One small quibble: you’d never know there was a mobile app unless you saw the Android Play Store download button in the site’s footer. 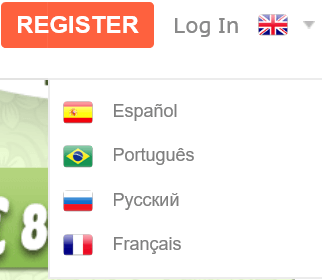 While Lotto Agent caters to an international audience, it only has 4 language options on its website. There’s English, Spanish, Portuguese, and Russian. The effort to include multi-language support is appreciated, but it would’ve been better if there were more languages available. Lotto Agent’s language options are pretty limited. Lotto Agent walks you through key processes like buying a ticket. You only need a few steps to buy tickets at Lotto Agent. What’s great is that there are instructions throughout the page: You’ll know what steps you need to take next, as well as what your options are. For example, are you unsure about playing a single draw, signing up for multiple draws, or subscribing? You just need to hover over the “?” icons to get some tips. Lotto Agent is one of the few lottery sites with systematic forms. Systematic forms allow players to purchase an entry that plays more numbers than normal tickets. Systematic forms boost your chances of winning, since they cover as many number combinations as possible. Initially, theLotter was the only website with this feature. But now, Lotto Agent has it too! Lotto Agent’s systematic forms feature lets you purchase tickets with anywhere from 6 to 10 numbers, translating to 6 to 252 lines. Even better, each option comes at a significant discount, from 11% up to 15% off. Lotto Agent offers a unique feature: livestreaming. At Lotto Agent, you can pull up live feeds for just about every lottery game. Plus, you can watch past livestreams via their archives. To be honest, livestreams aren’t groundbreaking nor particularly helpful. But they do make the experience more engaging compared to simply checking for lotto results. Lotto Agent isn’t an official partner of any Australian lottery operators, but Australians are still welcome to play through the website. Lotto Agent offers two of the biggest US lotteries — the Powerball and Mega Millions — as well as smaller games like the New Jersey Pick-6, Lotto Texas, and Super Lotto. Unfortunately, the US’ federal laws still forbid citizens from participating in online lotteries. If you’re based in a different country though, then you can probably play any of these games through Lotto Agent. You should definitely check out Lotto Agent. Despite a few shortcomings, you get a good playing experience without breaking the bank. Lotto Agent is probably one of the most affordable lottery agents available online. You can get most discounts automatically — just buy 3 or more tickets or get a friend to sign up, for example. There are a few hiccups here and there: the mobile app should have had an iOS version, for example. But overall, Lotto Agent has excellent security, a well-designed website, and impressive support for any and all players who choose to play through their site. If you’d like a premium online lottery experience without having to pay premium prices, give Lotto Agent a try today. Hey Steve, thanks for asking! We’ve reached out to Lotto Agent about the issue. Rest assured we’ll update the review as soon as we get concrete details direct from the company themselves. Hi Prasanna, that usually depends on the lottery game operator: most lottery games will require you to claim the ticket in person. Lotto Agent can’t do anything about this, but they do extend a lot of assistance. You can expect a Lotto Agent representative to give you dedicated support throughout the process. Am just curious to know how does the transaction works if one wins.. from India. Taxation ? Has anyone won from India ? Hey Arpana, you’ll still need to claim jackpots in person. As for taxation, that depends entirely on your local laws. Best to check those and reach out to Lotto Agent for the detailed prize claiming procedure. Thanks! can i trust if i won lump sum first prize can i get it easily from India? will help to collect my prize money? Hi, Pagow! Most of the time, you’ll have to claim the jackpot in person. This is usually because of rules set by the lottery operator. The good news is that Lotto Agent tries to make everything as easy as possible! They’ll call you up, guide you through the process of claiming the prize, and help you with all the necessary arrangements. Recently i have had a bad experience with Lotto Agent. I lost 15$ because they just wanted to show off like professionals than are really concerned about solving the issue. They always react like cunning foxes giving bull$hit political answers, that too after taking too many days to respond… Finally when I gave up on getting back my 15$, they were literally happy to end the ticket. Now I can say, I actually dealt with beggars, not professionals..!